Progress! That's what these Dark Ages need, someone with a little get-up-and-go. You've been a serf in this one-pig town long enough, and it's time to shake things up. 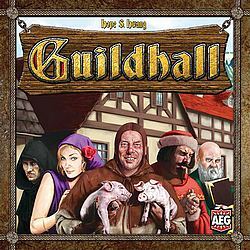 You've opened a guildhall for like-minded professionals from all over Europe to work together, build their trades, and get some economic stability. Well, you'll just have to do it faster than those other guys! Gather professionals into chapters, and use their combined might to reach for victory. Collect complete color sets of professions (all five colors of Trader, for instance), which you use to buy victory points (VP). The first player to gain 20 VP on her turn wins.